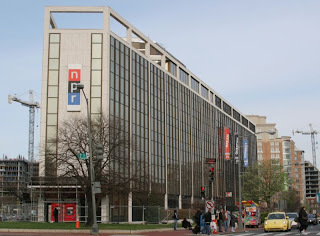 Now The Details: Lost Generation Radio at NPR? Lost Generation Radio at NPR? The implications of the layoffs at NPR continue. Last week, NPR announced that seven per cent of the staff would be eliminated. Most by cuts; others by leaving vacant positions unfilled. As mentioned in a previous post, the economics of public broadcasting with its dependence on listener donations to stations and underwriting support are being severely tested during this financial crisis. The unhappy result was a loss of some senior journalists and other longtime NPR employees. No list of who was cut has been made public as that is a private matter between NPR and the individuals concerned. We do know that many of the employees who are leaving will take with them an irreplaceable institutional memory. From my experience - and with the pounding going on in other media companies, I think NPR management did an amazing job in limiting the cuts to only seven per cent. But one person who went public with his layoff still is evoking much concern. It revolves around Doug Mitchell who ran NPR's "Next Generation" training program. I have received a lot of email from NPR staffers, station reporters and even a few listeners, all condemning Doug's dismissal as shortsighted. Ellen Weiss is NPR's VP of News and Information, a position I held from 1997 till 2000 and whose dilemma I empathize with. 1. We had to keep our paid internship program going - as one of several paths for diverse, young journalists into public radio, this program has had an incredible rate of return. 2. The next generation project might really benefit by rethinking its focus and targeting universities and member stations with more effective training and recruitment - and that's where we are headed. I'm just now making the transition from last week's news, to this week's planning - but I do believe that public radio has a bright future and that includes reaching out to new and potential journalists. I appreciate Ellen's perspective and the enormous challenges and demands on her. And I agree with her that NPR's best years still lie ahead. But while none of us is irreplaceable, the loss of Doug Mitchell to NPR will be seen equally as symbolic as real. His departure will likely be felt far beyond the NPR confines of Washington DC. That's because one of the most rewarding, difficult and unique aspects of NPR's culture is in its relations with the more than 700 member stations that air the NPR product and on which NPR depends for its financial survival. Managing in public radio has been described as the equivalent of "herding cats." Indeed. But it can be done. When NPR and the stations are able to balance their often conflicting needs and perspectives, that's when the stars are in alignment and the system can work for the benefit of all - for the listeners, especially. And that's why Doug Mitchell's departure has significance and importance for the future of public radio. Many young reporters and station managers viewed him as their champion and their access point to NPR News. The new NPR President Vivian Schiller arrives in January. When she does, she will immediately be facing that unique public radio culture, in all of its complexities. But with all of its satisfactions too. Can you help me understand the distinctions? EW says in her response that 'we need to preserve the paid intern program' - was that what NextGen represented, or was it larger than that? And what about 'paid' interns vs. unpaid - doesn't unpaid internships 'skew' towards the priveledge who can afford to be supported while they work for free? I think I'm just a bit confused by what happened, and what EW was saying. Thanks! We will, of course, see what comes of this over next few weeks/months, but it DOES seem really short-sighted. The bang-for-the-buck that Doug Mitchell represents and his "location" -- right there at the heart of the pipeline -- makes one wonder how smart a business decision cutting his position is. Maybe if the media economy is contracting it makes sense to produce fewer radio journalists? NPR management should realize that we out here in listener/supporter land need to have faith in their common sense. We're generally pretty open-minded about their new "strategies" and "orientations" and such, but the flip side of that is that if they lose our faith it will take a whole lot to get it back. A lot of folks have "gotten over," for example, the morning edition changes of a few years back, but we still think it was not an inspired move and that the execs' spinning of it was quite un-NPR-like. So, I guess I just hope the powers that be are being smart this time, even if some of us don't understand.